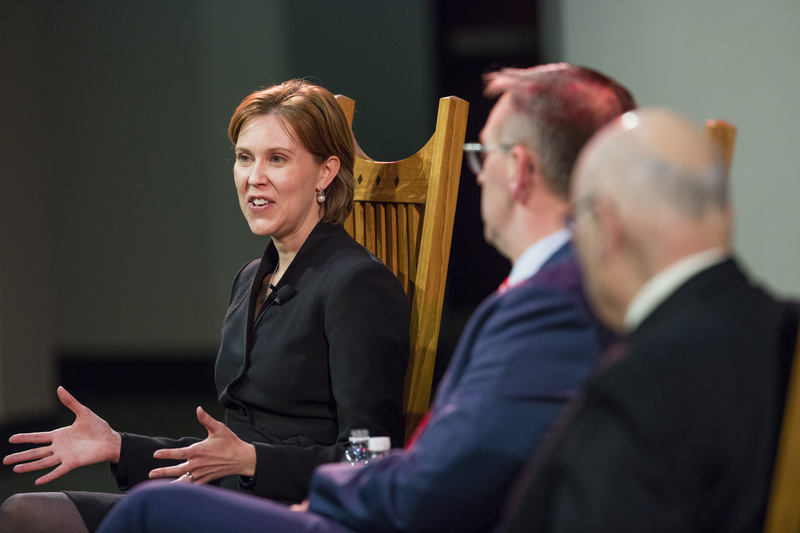 Darci Vetter (left) speaks while Chancellor Ronnie Green (center) and Clayton Yeutter listen during a Heuermann Lecture in January 2016. Vetter has been named diplomat in residence to help launch the Clayton K. Yeutter Institute of International Trade and Finance at Nebraska. Ambassador Darci Vetter, former chief agricultural negotiator at the Office of the U.S. Trade Representative, has been named diplomat in residence at the University of Nebraska-Lincoln. In her new role, Vetter will work with leadership from the university's College of Law, College of Business and Institute of Agriculture and Natural Resources to launch the Clayton K. Yeutter Institute of International Trade and Finance. "The vision of the Yeutter Institute is to educate people on international markets and trade, a space where Nebraska is a major player due to its agricultural contributions," said IANR Harlan Vice Chancellor Mike Boehm. "Darci Vetter is one of the world's foremost experts in trade and we look forward to her visionary input in facilitating conversations surrounding economic vitality related to international trade and the role Nebraska plays." As chief agricultural negotiator from 2014 to 2017, Vetter led bilateral and multilateral trade negotiations on agriculture, including negotiating the Trans-Pacific Partnership agreement’s agricultural package. Vetter also brings experience at the U.S. Department of Agriculture and on Capitol Hill to her new role. She oversaw the USDA's export promotion and international development programs as deputy under secretary and advised the Senate Finance Committee on trade issues related to agriculture, the environment and labor. She began her trade policy career as a civil servant at the Office of the U.S Trade Representative, covering agriculture and environmental issues. Vetter received her Master of Public Affairs degree and a certificate in science, technology and environmental policy from Princeton University and her undergraduate degree from Drake University in Des Moines. Vetter grew up in Nebraska on a family farm, and she said she looks forward to returning to her home state to help shape the Yeutter Institute. "Clayton Yeutter's work formed the foundation that guides the way we negotiate in a global marketplace," Vetter said. "The Yeutter Institute provides a tremendous opportunity to shape the next generation of leaders in international trade and global finance, and I look forward to using the lessons I learned from Clayton to help launch it." The university and the University of Nebraska Foundation have been conducting private fundraising for the planned institute, which is pending Board of Regents approval. A renowned trade expert and Nebraska alumnus, Yeutter made a $2.5 million leadership gift through outright and planned gifts to establish the Clayton K. Yeutter International Trade Program Fund at the foundation. Yeutter, who died in March at 86, held three cabinet-level posts for two U.S. presidents. He was counselor for domestic policy and secretary of agriculture for President George H.W. Bush and U.S. trade representative for President Ronald Reagan. Most recently, Yeutter was senior adviser of international trade for Hogan Lovells, LLP, in Washington, D.C., one of the nation's oldest and largest law firms. He was born in Eustis and spent 18 years operating a 2,500-acre farm, ranch and cattle-feeding enterprise in central Nebraska. "Clayton Yeutter had a profound influence on his alma mater, the state of Nebraska, our nation and the world through his leadership in trade and agriculture," Chancellor Ronnie Green said. "His legacy will live on for years to come as the Yeutter Institute produces graduates uniquely prepared to provide leadership in the global marketplace immediately upon receiving a degree from Nebraska." Last fall, the university announced three endowed chairs will be established as the foundation of the Yeutter Institute. The Duane Acklie Chair will be in the College of Business; the Michael Yanney Chair will be in the Institute of Agriculture and Natural Resources; and the Clayton Yeutter Chair will be in the College of Law.